You’re pregnant. It’s exciting and you cannot wait to hold that sweet babe in your arms. Your head is filled to the brim with all things baby but what about you? What products do you need to make pregnancy easier? I asked our community of over 600 moms their input on what products newly pregnant mamas needed to make pregnancy easier. Want to know what they said? 10. 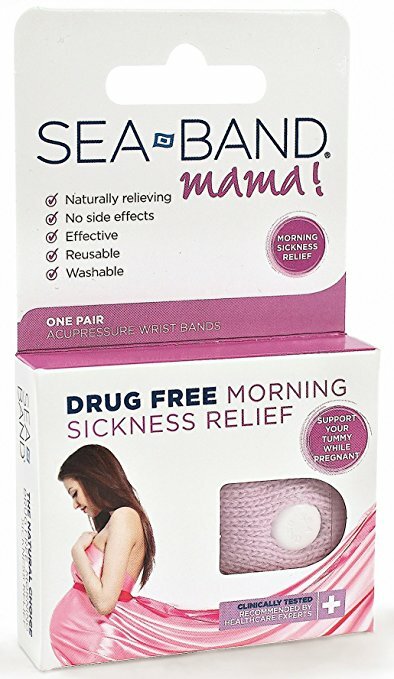 Sea-Band Mama Acupressure Wristband – Many women who experience mild nausea swear by Sea-Bands. I used them when I was pregnant with my third and was really impressed by how well they worked! The band is a bracelet that applies pressure on the P6 (Nei-Kuan) point between the two central tendons near the wrist. This helps alleviate nausea. Definitely give this one a try before you resort to medication. 9. Belly Band – A Belly Band is a stretchy, tube-like accessory that can be worn during those in-between stages of pregnancy when you’re not quite ready to pull out maternity pants but your favorite pairs of jeans won’t snap any more because of that growing baby bump. There are a number of these on the market and it’s really hard to not find one that’s a good fit. Try Maddie Moo, Ingrid & Isabel, Belevation (pictured), and Belly Bandit found at Target. 8. A Good Maternity/Nursing Bra – News Flash! Your breasts are going to grow…and grow…and grow. You’ll need a good maternity bra that will get you through potentially 40 weeks and then some. Check out Cake Lingerie, Bella Materna, and Bravado if you’re heavy chested (I for sure am!) and if size isn’t really something that you need to worry about you can look at those mentioned brands as well as Lamaze, Playtex, and Leading Lady. A maternity bra does not have to be hideous, trust me on that one. 7. 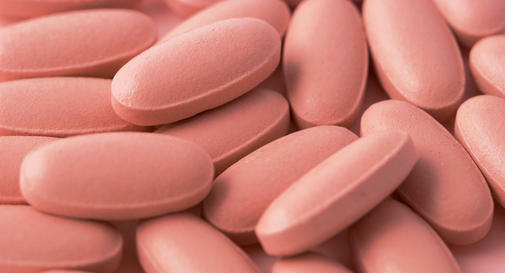 Prenatal Vitamins – The unfortunate truth is that we do not get all of the vitamins and minerals needed in our daily diet to successfully not only sustain a pregnancy but also keep mama healthy. Your body knows what it’s doing and when you’re pregnant whatever nutrients you do get goes to the baby. That’s why it’s so important to have a quality prenatal daily vitamin as well as a calcium supplement. Some reputable brands are Rainbow Light, Nordic Naturals, Garden of Life and any of the other big name brands. 6. Acid Reflux Relief – Antacids and Hazelwood Necklaces (for the crunchier mama) could very well become your best friend during the latter part of pregnancy when there’s really no room for stomach acid to go. The other relief you can have is by avoid acidic foods such as any citrus, tomato-based foods or rich food. I had a lot of success curing my acid reflux by drinking carbonated water. 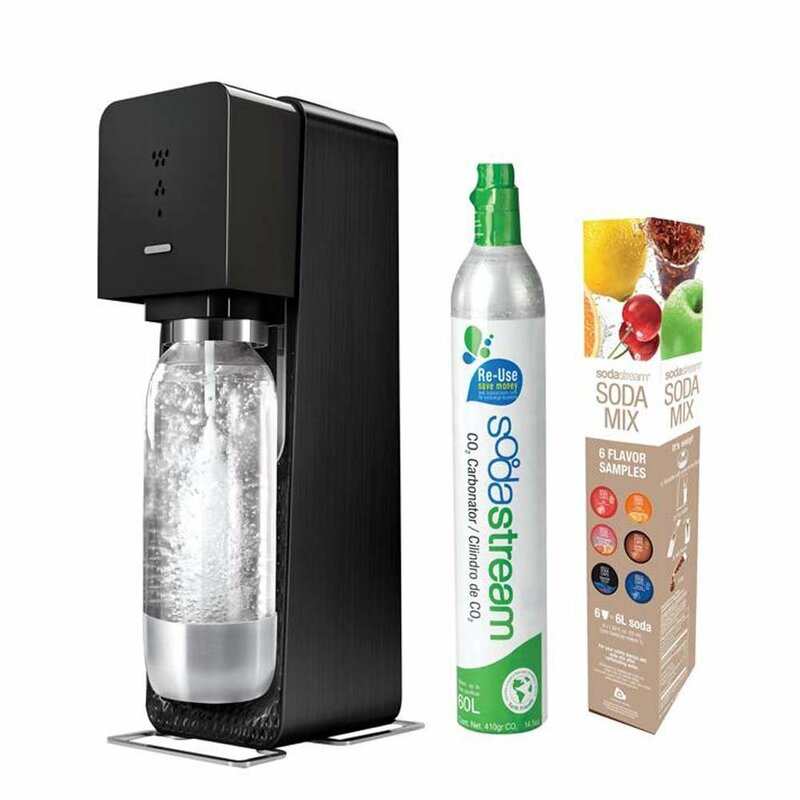 We bought a SodaStream and it is my favorite kitchen gadget to date. I use it religiously without any of the syrups. 5. Leggings – Why waste time with jeans when you can wear leggings? Seriously though, you should have a good pair of jeans and dress pants for those times when you want to look nice, but if you’re following the LuLaRoe craze you’re in luck because pairing leggings with long tunics and shirts is IN. 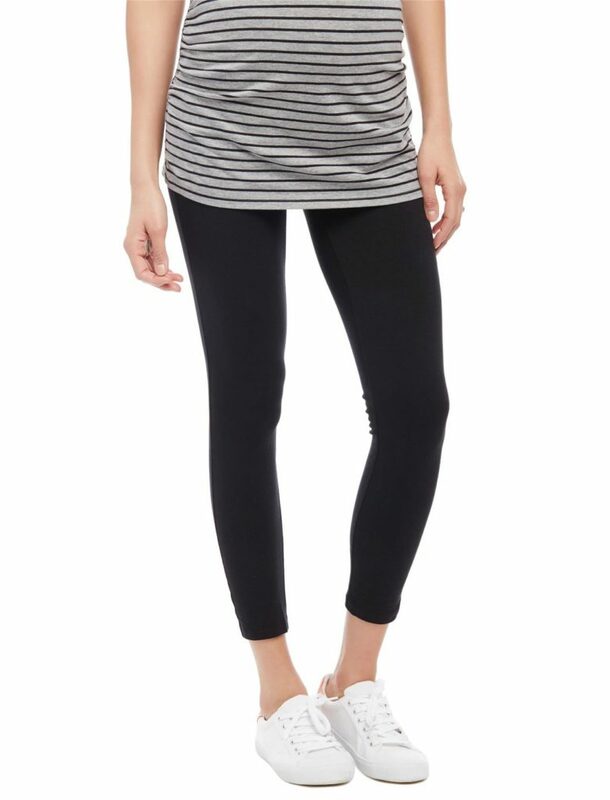 If you are looking for something other than leggings check out Liz Lange’s line at Target and Motherhood Maternity. I also had a lot of luck with Zulily when it came to finding clothes. 4. Cute, Supportive Shoes – If you’re working a job that has you on your feet a lot now is the time to invest in some good shoes that offer support. The farther along in your pregnancy the heavier that belly is going to get and that my friend, is challenging to say the least. A few options, in my opinion, you have are Dankso, Vionic Orthaheel Sandals, Naturalizer, and Born. For the time being, especially when your balance is off from that baby belly, just say no to heels. Trust me, I fell when I was pregnant with my first baby. 3. 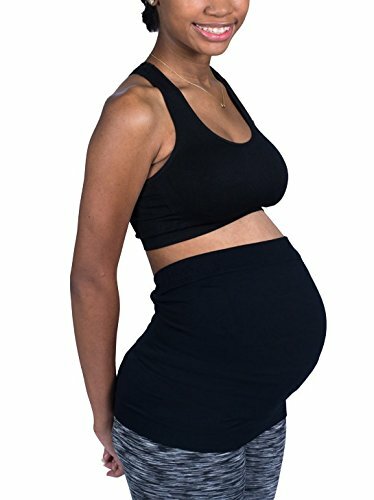 Stretchy Maternity Camisoles and Tank Tops – A maternity camisole or tank top will help you extend your wardrobe as your baby grows. You won’t need a ton unless of course you like an assortment of colors. I always had one black and one white cami in my maternity wardrobe. 2. Lotion for stretching skin – Whether or not you’re prone to stretch marks (it really has to do more with your DNA than anything else) you will want to have a good body lotion for your belly as the skin stretches and pulls. Makes me itchy just thinking about it! A few of my favorite brands are Burt’s Bees, Mustela, and Balm Baby Mama Belly. And the #1 product you need to make your pregnancy easier? If you aren’t sleeping, baby’s not growing so invest in a quality pillow for that growing belly of yours. My favorite, although they’re not in production currently, is the Bump Nest. Otherwise some other highly suggested pillows from our Mom Hub members were Boppy, Snoogle, and PharMeDoc Full Body Pregnancy Pillow. There you have it! I’m not the absolute authority on this though so tell me what your pregnancy must haves are! Pin it so your pregnancy brain doesn’t have to remember! My favorite and longest lasting piece of maternity supplies has to be the stretchy tank top. My youngest is 3 and I still have hung on to a few of those. I’ve even been tempted to buy a few more. Yes!!!! I love all of the ones that I had. I finally had to trade my white one in because the pits were yellow! I have 3 pregnant friends, and this is immensely helpful! This would have helped for when I was pregnant! Although I am done having babies, these are some really nice products. A lot of them weren’t even available when I was pregnant. Such is life, right?! Kills me that I didn’t have most of these products until my third pregnancy. Thank you for sharing. I will have to show these tips to my granddaughter. She is having her first baby. Thank you for passing the information along! Thanks for sharing!! The morning sickness pills would have helped with my last pregnancy! I never threw up with my first 2..NEVER got sick! My last one I got sick 24/7 everyday all day even woke up everynight sick! The heartburn relief was huge. As was a stool softener. That is definitely something no one mentioned to me!!! morning sick pills are always great and we try not to think about it! I love the Maternity/Nursing Bra. Me too! It is a must!